Praveen Siddannavar's Blog: Beauty On The Hills! As we reached the forest entry gate, we had to pay entry fees and proceed, while driving the steep hills, our driver suddenly screamed Sir “Tiger”, where I asked him he said on the slopes. 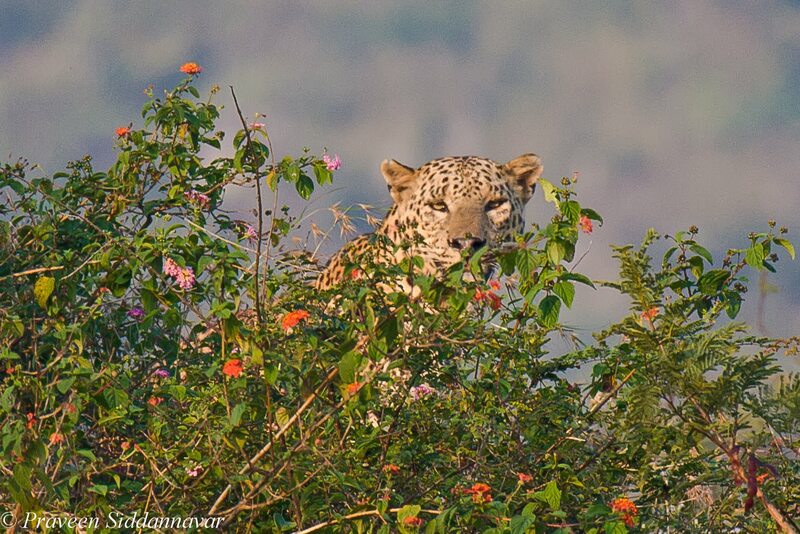 I quickly looked out and to my surprise it was a Leopard, with so many people in our mini bus and the human noise the leopard hid in the bushes behind the lantana. 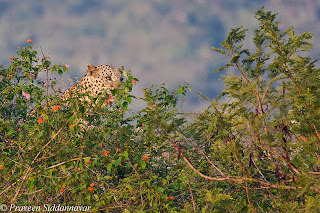 When I first saw the leopard he was in very much in the open on the hilly slope waiting for the sun light as it was quite cold. 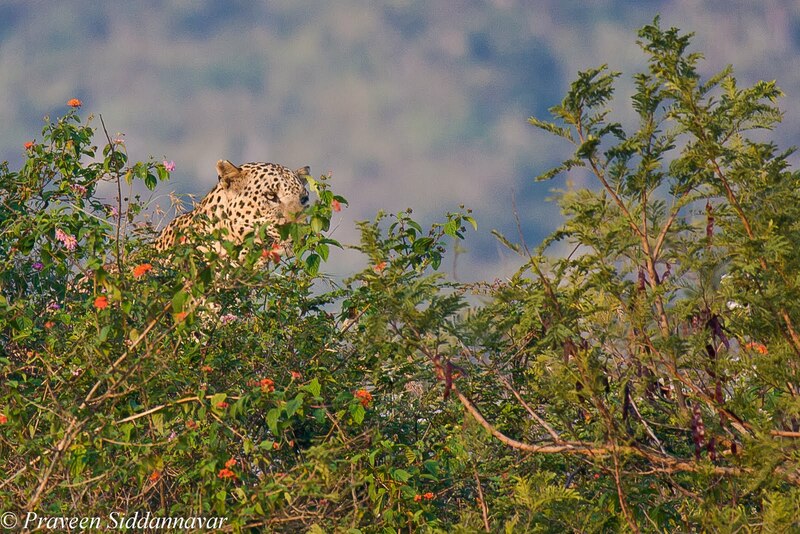 Leopards are the most elusive cats in the wild & very shy by nature and hardly one can see them in the open during the day light, most of the time they are on trees or hidden in the under growth. 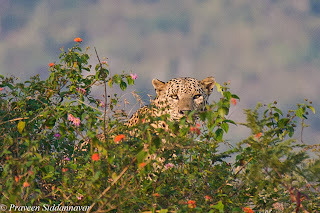 My camera was packed in my bag, when we first spotted the leopard, by the time I unpacked and connected my lens, we could still see the leopard but he was hidden behind the bushes so I had no chance of getting any images. I requested everyone to maintain silence with the hope that leopard may come out, however he never came out. After a while I got down from the vehicle and was looking around. 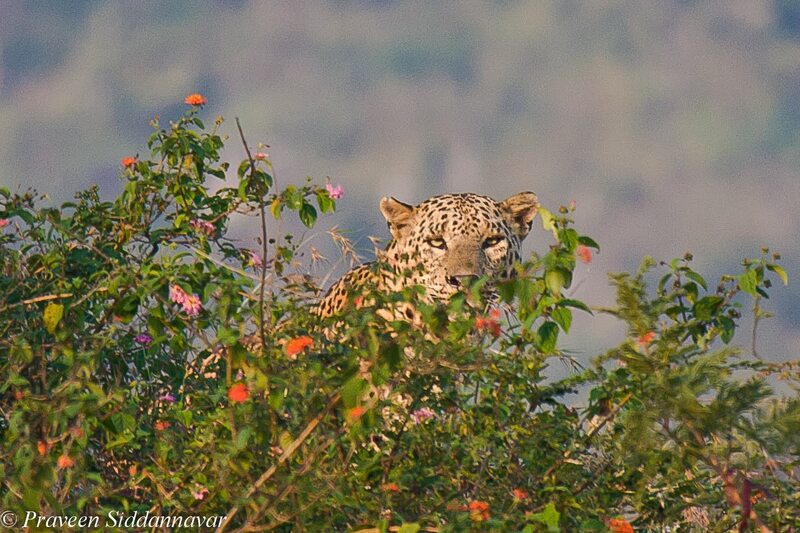 To my surprise the leopard who was hiding behind the lantana peeped out to check our presence. This was my only chance to photograph him, I stood in front of him like a statue and clicked multiple shots, within minutes he vanished again in the under growth. 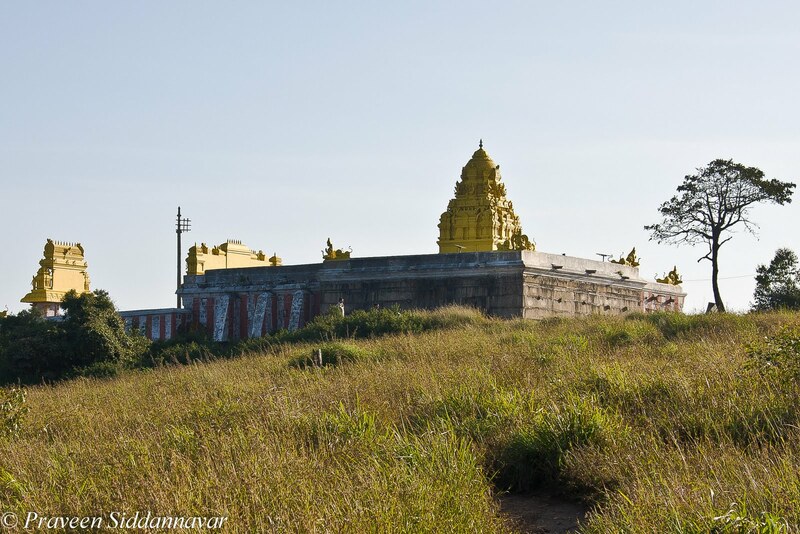 I have traveled to Gopalswamy betta on many occasions but had never sighted a cat here, this was totally unexpected. 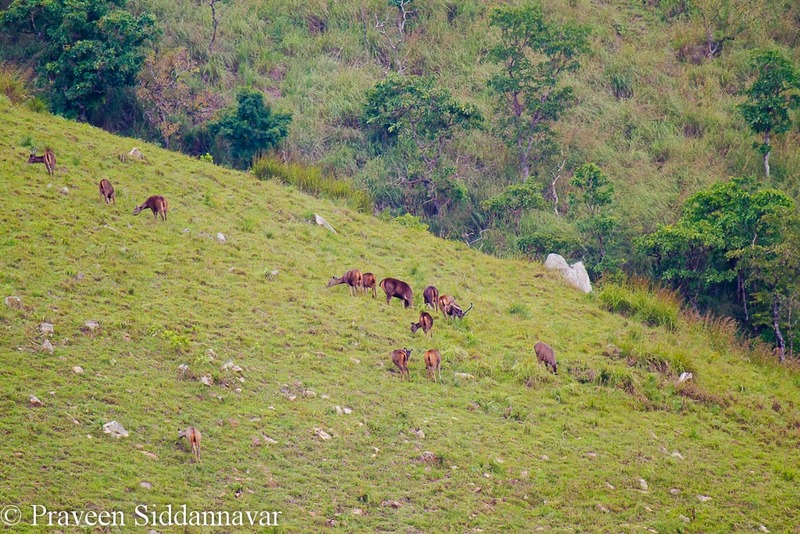 It is rightly said that the wild animals make their appearance when they are least expected. The leopard was huge and healthy, what a moment this was, if I think about it even now I can’t believe & I am sure I will not get over it forever. 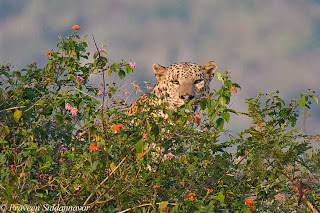 This was an excellent day to start with a leopard sighting, later while trekking we sighted a herd of 14 elephants also captured in my camera, a huge bull (Indian Gaur), Sambars and Spotted deers. 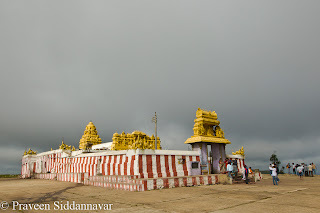 Gopalswamy betta is ~220kms from Bangalore, 80Kms from Mysore, 80kms from Ooty, 15kms from Bandipur and 12kms from my farm. There is no doubt that anyone who visits this place will fall in love with it instantly. 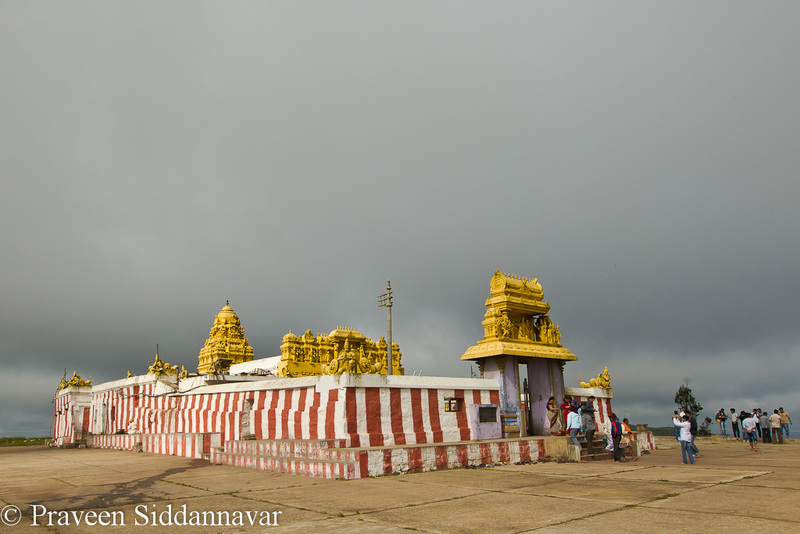 Himavad Gopalaswamy Betta is covered with mist for most parts of the year and hence the first part of the name is “Himavad” meaning mist and the presence of the ascetic ancient temple on top dedicated to “Gopalaswamy/Lord Krishna” forms the second part of the name and the third part is contributed by the fact that it is a hill/Betta, which is ~3000 feet above sea level. 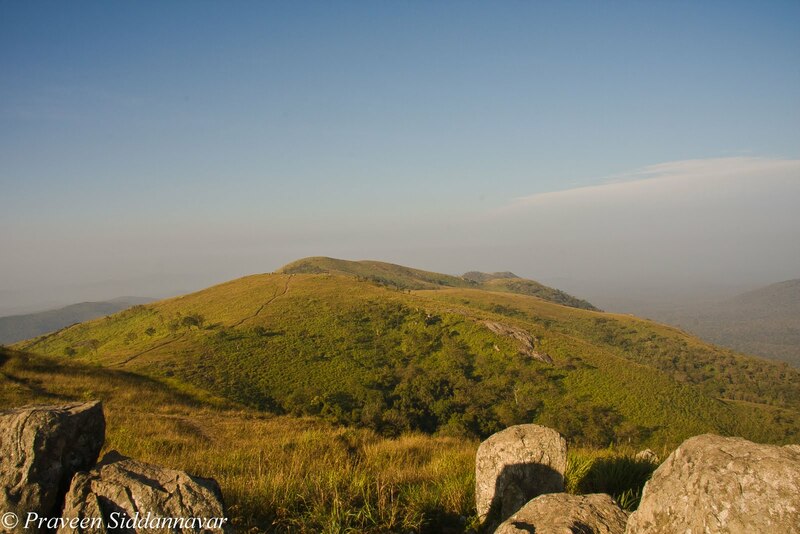 This hill is the highest in this region and is part of Bandipur National Park core zone, South of Karnataka. 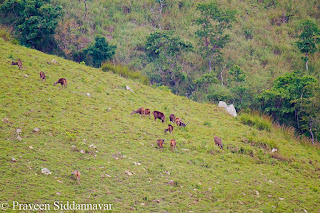 This region is under Project tiger funded by WWF.In the early mornings the clouds cling to the top of the hill and by afternoon they move away reluctantly only to return by 4 P.M. If you have ever dreamt of walking into the clouds or touching the cloud, then this is the place to realize your dreams and be literally on cloud 9! These regions were a favorite hunting ground for the Mysore Maharajahs and their British guests. The royals have built a guesthouse on top of the hills and there are some rare pictures of the Maharajahs and their guests with their prized hunt…the tiger.